The philosophy of Confucius was so powerful that it dominated intellectual life in ancient China for centuries. It even came to be considered a religion, and there are still temples where Confucius is worshipped as the God of Culture. His writings were transmitted as aphorisms, each one of them one concentrated teaching about philosophy, ethics, or society. We have selected for you 100 of these teachings, so you can discover how the fundamental teachings of ancient China still nourish our daily life. 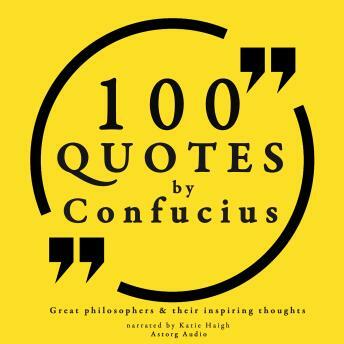 Meditate on Confucius' philosophy, discover one of the greatest authors to have ever lived, and see how his quotes will empower your life with their ancient strength.